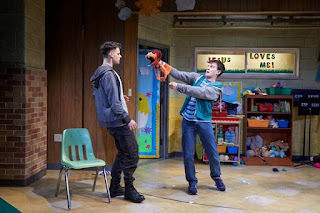 The story is set in Cypress, Texas, in a church basement where Margery (Lisa Velten Smith) is developing a puppet ministry under the auspices of Pastor Greg (Peter Benson). Only three teens attend; bad-boy Timmy (Miles G. Jackson), pretty Jessica (Maggie Carr), and Margery’s quiet son, Jason (Nick LaMedica), the creator/operator/voice of Tyrone, who eventually “possesses” Jason. We learn that Margery and Jason have recently undergone a serious family tragedy that influences their behavior toward each other and provides the impetus for the relationships that ensue. The message of the story shines but the cast shines even brighter. The talented actors in this production brilliantly directed by Tracy Brigden are spot-on with their characters, accents, and comedic expressions. Each shines in their role and evokes empathy that helps defy stereotypes. Without a doubt, Nick LaMedica stands out as he embodies the shy young man who is fighting with the satanic hand puppet, Tyrone. LaMedica has the overt physicality and vocal dexterity to make you believe he and Tyrone are two separate entities. The cast and play are beautifully rendered on Luke Cantarella’s revolving set that includes clever projections, complemented by Matthew Richards’ lighting and Elizabeth Atkinson’s sound design. Vibrant colors are enhanced by Tracy Christensen’s costumes, and the puppets, designed and constructed by Stephanie Shaw, look like they are capable of good and evil. It should be mentioned that this play might not be suitable (or palatable) for everyone. 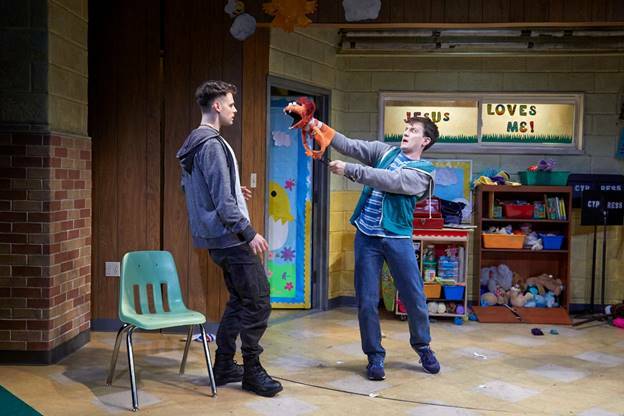 TheaterWorks warns that “This play is rated R for Rude, Raunchy, and Riotously Funny,” this reviewer thought it was, but there were some patrons who found it a little too graphic and “over the top” for their tastes. Upon entering the theater, there is a billboard stating, “Does life stink? We have a pew for you.” If you like that type of humor (and get it), then you might enjoy this show very much. One leaves the theatre with great appreciation for the originality of the script and the incredible skill of the actors and production team. This would be an easy show to do badly, but TheaterWorks gets it just right.